AskAlan: Should we care who is No. 1 in the world? #AskAlan mailbag: Should we even care who is No.1?! ‘Tis the season… List of books/content we should be asking for as Christmas gifts? I’ve got Golfer’s Journal, Confidential Guide Vol. 5, and Keith Cutten’s new book on my list. What else? Are there any books that aren’t $70 since apparently non-golfers think that’s high for a book... -PJ (@p3stock) No joke, include a subscription to GOLF magazine on that list. With the February 2019 issue we’re unveiling a total redesign and it’s going to be f’ing awesome. It’s true that golf’s coffee table tomes are very expensive but there are tons of great books you can get for $25 or less. In no particular order, here is a sampling of my favorite golf books: Down the Fairway, Bobby Jones Golf Dreams, John Updike To The Linksland and Men In Green, Michael Bamberger The Bogey Man, George Plimpton The Golf Omnibus, P.G. Wodehouse Ancestral Links, John Garrity Dead Solid Perfect, Dan Jenkins The Autobiography of an Average Golfer, O.B. Keeler The Spirit of St. Andrews, Alister MacKenzie Arnie, Tom Callahan Alister MacKenzie’s Cypress Point Club, Geoff Shackelford What's with the constant references to being No. 1 in the World Ranking? Majors and wins and Ryder Cup stardom are what count, not a contrived mathematical formula that deems a particular player "the best" because he's ranked No. 1. Westwood, Donald and Lehman made it, so big deal. [email protected] You’re forgetting the brief but glorious reign of Martin Kaymer! I hear what you’re saying. It’s especially unsatisfying right now when the top spot seems to change every coupla weeks. But the Ryder Cup happens only every other year. With the new schedule it’s now going to go nine months between the playing of the Open Championship and the ensuing Masters. What are we supposed to talk about… FedEx Cup points?! The battle for No. 1 is a fun subplot, as long as you don’t take it too seriously. 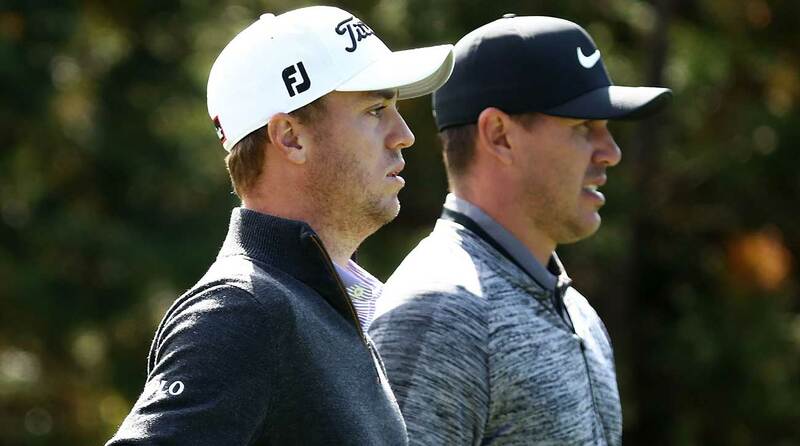 Justin Thomas and Brooks Koepka have been among those who have battled for the top spot in the World Ranking this year. Is men's golf capable of another transformative player? Nicklaus and Tiger were so dominant in large part because they were longer. But are we nearer the limits of that skill? Can any player really dominate with another skill? -Greg (@gkellynyc) We only thought we were at the outer limits of driving distance, and then along came Cam Champ. But there is certainly a point of diminishing returns – until the advent of the #9K yard course, there are only so many holes where a guy like Champ can truly separate himself. Spieth’s all-around game has always been underrated but there’s no doubt his seven-win, two-major binge across 13 months in 2015-16, and his epic back-nine rally at Birkdale, was built on historic putting. But as we saw in 2018, that is harder to sustain than the kind of driving that keyed Nicklaus’s long-term dominance. The new equipment, outdated ballparks and prevalence of advanced stats and training methods have all leveled the playing field, which is why we are seeing so much parity at the top of the game. Brooks Koepka has discovered the secret sauce but even if he wins another half-dozen majors, I’m not sure he’ll count as transformative. He’ll just be remembered for doing a few things slightly better than everyone else. MORE: GOLF's Ultimate Holiday Gift Guide He’s designed a couple of Top 100 in the world courses, and even a few gems in the Northeastern United States, but outside of Canada, Stanley Thompson seems to be a designer very few speak of. Is he on the list of all-time great course designers? If not, who are the GOATs? -Tej (@boatical) I think Thompson is more of a cult classic than a GOAT. When you talk about the greatest course architects of all time, the list begins with Old Tom Morris, MacKenzie, Ross and Tillinghast. Some of Pete Dye’s more audacious creations haven’t aged well but he still makes the list. Coore/Crenshaw have earned a place in the pantheon, along with fellow modern masters Doak and Hanse. MacDonald and Raynor are a quandary for me: their influence is massive and a handful of their courses utterly spectacular, but reproducing the same holes over and over strikes me as a lesser art. Still, they have to be listed among the GOATs. Robert Trent Jones is also an interesting case: he was a great showman who helped popularize the very concept of a golf course architect, but how many classic designs did he create? Spyglass, yes. Peachtree? Okay. Mauna Kea? Maybe. Valderamma, Firestone and Hazeltine don’t blow my skirt up but there’s no denying their championship pedigree. I guess he has to make the cut. The next tier of greats but not GOATs would include Thompson, George Thomas, Bell, Colt, McLay Kidd, Strantz and, gulp, Fazio. What has happened to Lydia Ko? Used to be dominant. Changed coaches etc. seems like no one ever mentions her anymore. Any insight? She was gonna be the next biggest thing at age 18! [email protected] Ko is one of my favorite people in golf and it’s been a bummer to watch her struggle over the last two years. All the swing changes, equipment changes, caddie changes and management changes have no doubt deeply unsettled her. Lydia’s easy smile and carefree New Zealand vibe always masked the intense pressure she was under – from her parents and trying to live up to the incredible expectations she created as a mere 15-year-old. I think some of what we’re seeing is burn out. Also, the women’s game has evolved into a bomb-and-gouge style and Ko is giving up a ton of firepower to Ariya and Lexi and Brooke and other neo-bombers. Ko is only 21 so there is plenty of time for her to get back to her winning ways. But it’s also hard not to think of Yani Tseng, who enjoyed one of the most dominant runs in LPGA history only to inexplicably fall into the abyss at age 23. Apart from Champ, who is the rookie to follow on the PGA Tour next year? [email protected] I’m most interested in Jose de Jesus Rodriguez, the 37-year-old rook from a tiny town in central Mexico. El Camaron is a legend on the Latinoamerica tour, not only for the quality of his golf but also his humility and amiability. It’s been a very hard road for JDJR to make it to the Tour and I hope he makes the most of this golden ticket. Will the Players ever be considered the 5th major? It seems the PGA Championship is the 4th most important, and the Players is almost equal. Would it just happen without our knowing? [email protected] Oh gawd, I thought I had until March before having to deal with this question. It’s true that when Gene Sarazen won the 1935 Masters no one pounded him on the back and said, "Congrats on your first major, old boy." These things evolve over time. But it’s never going to happen with the Players for the simple reason that all of us diehards in the media will make sure it never happens. Who among these youngsters has the better career trajectory: Bryson, Rickie, Jordan, Justin, Xander, Tommy, Jon or Tony? -Ian (@DizzyG1964) Spieth quite clearly has had the best career so far but his current trajectory has to be a concern, given his struggles over the last 18 months. Of all the players mentioned above, who will win the most majors from this point forward? You’d have to say Justin Thomas. For starters, he has already shown he can do it. He’s proven to be a prolific winner on a variety of courses, a testament that he has no holes in his game. And he has a certain flair for the moment – see his walk-off eagle to shoot 63 at the U.S. Open or his slaying of Rory in the first singles match at this Ryder Cup. So I like his traj above all others. Is it okay to keep my clubs in my cold garage over the winter? [email protected] They won’t sustain any lasting damage, if that’s what you mean. But is it okay to be so thoughtless with your most important possessions? Put it this way: I keep my clubs in my bedroom, where they are nice and toasty and can readily be given the love and affection they deserve.